As we begin a new year, the officers and Directors of our club wish you all the best for 2004. Our club had a great year in 2003 and we look forward to an even better 2004. I would like to thank everyone who participated in our November auction. We raised a record $1,076.00. All proceeds go to the JHS German Student Exchange Program. It was great to see the students and parents participating and contributing along with our loyal club members. At our January meeting we will have our annual wine and beer tasting party. We will also have the nomination and installation of our Board of Directors. Please plan on attending. This year make an effort to invite a friend to a meeting. Also consider getting your children or grandchildren involved. We always welcome guests and new members. The Jasper Deutscher Verein held its annual fundraising auction benefiting the Jasper High School German Student Exchange Program at Veterans of Foreign Wars Post 673 on November 20 th . Over 100 members, guests, and JHS students were in attendance. Rich and Rachel Vonderheide greeted guests as they arrived. Dan Gutgsell, president of the Jasper Deutscher Verein, welcomed all present and opened the meeting with a prayer. Members, guests, and JHS students then enjoyed an appetizer and dessert buffet. Mr. Gutgsell then reminded members of the Jasper Deutscher Verein (German Club) German Heritage Endowment of the Dubois County Community Foundation and encouraged all members to make year-end gifts to the Endowment, which provides funds to benefit German heritage projects. German. The cost for the buffet and entertainment is $10.99 plus tax and beverage per person. Reservations may be made by calling 812-486-4900. Bob Dilger, Vice President, announced that the annual German Club Christmas Party will be held at the Jasper Country Club on Thursday, December 11 th . Gathering time will be at 6:00pm with a meal of fried chicken and trimmings at 6:30pm. Entertainment by the Jasper High School Show Choir will be at 7:30pm. Cost is $10 per person and reservations must be made by December 4 by calling Rita Egler at 634-9068 or Bob Dilger at 482-9149. The annual wine and beer contest will be on Thursday, January 15 th , at the Veterans of Foreign Wars Post #673. Members are encouraged to enter their homemade wines and beers in the judging contest. Rita Egler, Treasurer, gave the financial report. Dave Prechtel announced that the Guadalupe Center in Huntingburg will sponsor an International Coffee House on Saturday, March 20 th , at the Dale Parish Center. They are requesting club members provide German desserts or help with entertainment pertaining to Germany or donate items for a silent auction. Members may contact Dave Prechtel for additional information. Matthias Hilger, president of the Jasper Partnership Commission, then presented a Jasper-Pfaffenweiler Sister City Sign to the Dubois County Museum. The sign was accepted by Lowell Glendening, Fred Hollinden, and Janet Kluemper, members of the Deutscher Verein and Sister Cities and board members of the Dubois County Museum. JHS students in the JHS German Exchange Program attended the November meeting of the Deutscher Verein. 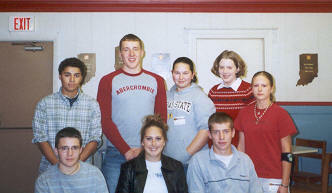 Pictured are 1 st Row L - R: Ross Fleck, Liz Book, Andy Kohls; 2 nd Row L - R: Alex Stemle, Nathan Humbert, Jennifer Kunkel, Kristina Denton, Cassie Humphrey. Students present from Jasper High School who are participating in the Exchange Program were recognized. Members and guests brought items to be auctioned with proceeds going to the Jasper High School German Exchange Program. Dan Hoffman was the auctioneer and he was assisted by the JHS students. The auction was very entertaining and successful with a record amount being raised for the Exchange Program. Attendance prizes were won by Martina Eckert, Vic Knies, and Andy Kohls. Linda Wehr won the ½ pot attendance prize. The remainder of the evening was spent socializing. The Jasper Deutscher Verein held their Christmas Dinner and Program at the Jasper Country Club on December 11 th . Over 90 members and guests were in attendance. Rich Vonderheide greeted members and guests as they arrived and Rachel Vonderheide provided Christmas music for those in attendance. Dan Gutgsell, president of the Jasper Deutscher Verein, welcomed all present. Father John Boeglin and Father John Breidenbach led the group in prayer before the meal. Bob Dilger, Vice President, announced that the annual German Club Wine and Beer Judging-Tasting will be held at the Veterans of Foreign Wars Post #673 on Thursday, January 15th. Members are encouraged to enter their homemade wines and beers in the judging contest. There will be more information in the club newsletter. Rita Egler, Treasurer, is accepting payment for 2004 club dues. Single membership is $5 and couple membership is $10. Dues may be sent to Jasper Deutscher Verein, Attn: Rita Egler, P. O. Box 15, Jasper, IN 47547-0015. Members of the Jasper High School Choral - Performing Arts Department under the direction of Stephanie Burns entertained all present with Christmas music and recitations. Attendance prizes were won by Bonnie Sergesketter, Cletus Hopf, Rich Meyer, Edward Wening, Bernie Weidenbenner, Sydney Bachman, Rita Egler, Ken Heim, Jonathan Dilger and Monica Jahn. Father John Boeglin won the ½ pot attendance prize. The club will provide cheese, beer and soft drinks. Linus Lechner will also be making some of his bean soup. Come prepared to have a couple of bowls! Members will be allowed one entry in each category and certificates will be awarded for 1 st , 2 nd and 3 rd place in the grape wine category and 1 st and 2 nd place in the non-grape / other wine and beer categories. While the judges determine the winners in each category, the audience will hear a presentation by Ron Flick on the Eckert Mill. As an active member of ROJAC and professional architect, Ron has learned extensively about its history and the current plans to rebuild this Mill. Come prepared for a fascinating and fun evening! President Bob Verkamp conducted the German Club meeting on Thursday, May 14, at the Schnitzelbank Restaurant in Jasper. Jutta Eisenring of Stauffen, Germany, who has spent this school year in Jasper, spoke to the club members about her year in America. She spoke mainly about the differences between German and American schools and in the ways of life. Matt Hilger, also from Germany and who will be working in Jasper for the next 18 months, was introduced. Ron Kieffner reported that this year's Strassenfest will have a definite German flair with some high energy entertainment scheduled throughout the weekend. The Jasper-Pfaffenweiler Sister City signs will be erected along the highways leading in Jasper. The signs will be up before the 1987 Strassenfest. Ruth and John Wibbels will be in charge of the annual family picnic, which will be held on September 19 at the 4-H fairgrounds. Mr. and Mrs. Bernie Vogler and Mrs. and Mrs. Ed Zoglman will be in charge of the German dance which will be held on April 16, 1988 at the Holiday Inn in Jasper. The souvenir committee reported that it will have plates, trivets, and pins available for tourists in the very near future. Items will be sold in the various gifts shops in Jasper. Claude Eckert is arranging transportation of the Pfaffenweiler guests and said that they will be arriving in Jasper on July 28 th . The rest of the lights for the murals on the east side of the Gamble building will be completed in time for the Strassenfest, according to Danny Wehr. Work is being done by E & K Electric Co.
Judy Bennet has drawn the plans for changing the looks of the Strassenfest stand. Jim Corn will help in the construction. It was announced that Dan Hoffman and Chuck Burk will take charge of this year's German Strassenfest float. Bob Verkamp presented slides of Alaska. There will be no German Club meeting in June, July, or August. The Deutscher Verein applied for a grant through the general grant making process and was granted $300 to update and reorganize the website. We want to utilize the Internet to provide educational information about us and our partnership to the rest of the world. The grant has to be used before June 30th, 2004. Plans are on hand for actions to be taken. Sister Cities of Jasper, Inc. also applied for a grant through the general grant making process and received a grant for $500 to help defray expenses of the JHS German Student Exchange Program. Monies for these grants come through the unrestricted endowments of the Dubois County Community Foundation. The Deutscher Verein and Sister Cities of Jasper, Inc. are grateful to the DCCF for the monies received to further their projects. The Jasper Deutscher Verein (German Club) German Heritage Endowment was eligible to grant out $100 and that money was put back into the Income portion of the Endowment for future projects. Remember, the Jasper Deutscher Verein (German Club) German Heritage Endowment is an excellent way to honor or remember someone special. And will also benefit future German Heritage projects. A group meets one half hour prior to the regular meeting to review conversational German skills.